Summary: Hanson comes to Pittsburgh to record a music video! (Insert female shriek here!) 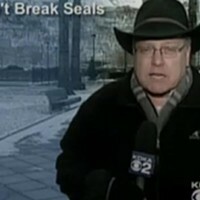 Reporter: David Hall, KDKA Channel 2 Airtime: 1 minute, 57 seconds on Aug. 20 Highlights: * When anchor Stacy Smith reminds us, "Paul McCartney is not the only musical act in town. 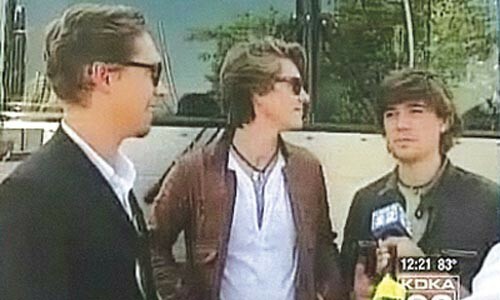 Today, the band Hanson is filming a music video in Pittsburgh." * When Hall explains, "Hanson wanted to give people here a chance to take part in a local music video, and people here took them up on that offer." * When Hall asks, "Do these faces look familiar? They're no longer the teens who had most people singing along to their hit, 'MmmBop.' Hanson is all grown up. The talented trio from Tulsa, Oklahoma, is fresh off of releasing their eighth studio album, Shout It Out, and tonight, they'll be playing a concert at the Carnegie Music Hall. ... But first, they stopped by the Carnegie Science Center to film a local music-video version of their song, "Thinking 'Bout Somethin'." * When Hall continues, "[The radio station] Q 92.9 thought of this idea, and the boys were all for it." * When Zac Hanson says the video expresses "[t]he spirit of anybody can dance, anybody can do this, let music kinda set you free." * When Hall adds, "The idea of doing this connects with at least that part of the idea of the video." * When Taylor Hanson (my favorite, ahem) tells Hall, "It's all about the music and all about connecting with fans." * When a Moon Township woman confesses her long love of Hanson: "It's like being 14 again. Every time I've seen them over the past 14 years, it's the same feeling. It's like, exciting!" * When Isaac Hanson remarks, "As an artist and a musician doing it, I kinda feel like, it has a similar effect on you as it does on the people in the crowd. You're playing it, but you're enjoying it." What We Learned: Yes, Prince, you can declare your artistic independence without changing your name to a symbol! Unanswered Question: When Lady Gaga comes to town, do you think maybe it would be a good idea for her to be the only musical act in town? News Value: 5. Hello, David? They are not "boys." They grew up a long time ago. But this story was a little breath of fresh air from the usual car crashes, shootings and fires that top the news every freakin' day. Hanson has always been a cool band in my book (the brothers play their own instruments! ), and a few years after their breakthrough album, decided to record on their own label -- and ended up being commercially successful anyway. Disclosure: The owners of 92.9 also own this fine publication.